On Sunday morning, one of the French women called my attention to the dorm's power strip, which was actually my power strip. I'd bought the power strip in Papeete for five bucks at the local equivalent of a dollar store, and didn't plan on keeping it, but its resignation was five days early, and now eight of us would have to recharge our cameras and phones from a single outlet. I shrugged, apologized for my feeble piece of electronics, and tossed it in the trash (then hilariously, a few minutes later, a different French women retrieved it to take to Reception to demand a new one—results TBD). I'd wondered why my camera battery had stopped charging early last night after our our afternoon excursion to Vaitahu, Tahuata. 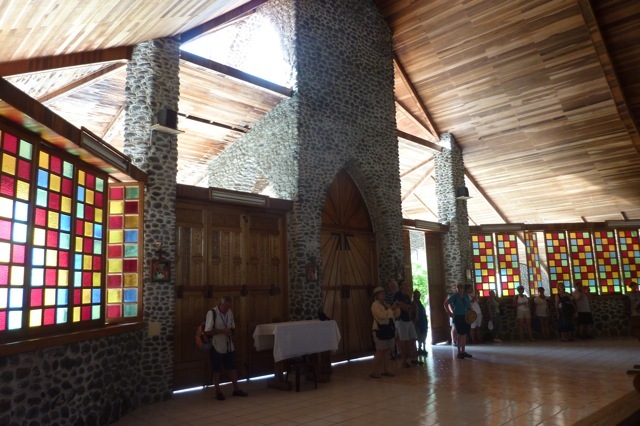 Tahuata, just 4 kilometers away from Hiva Oa, is the smallest populated island in the Marquesas. 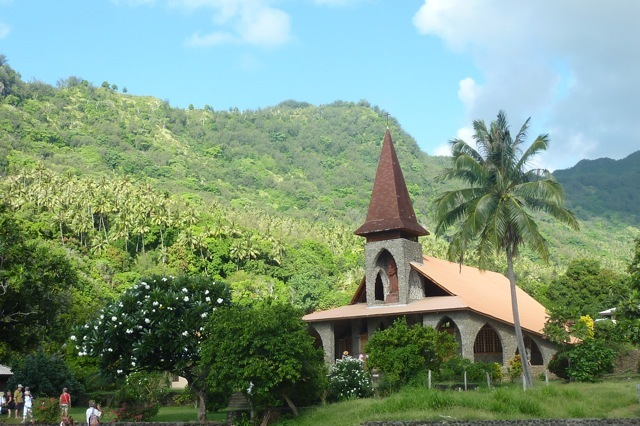 The main village, which we had anchored next to, is called Vaitahu, and like most places we'd seen, it's a small village set against dramatic craggy hills carpeted in green foliage and trees. This shoreline was dramatic and rocky, and more importantly, this island featured a pig on a leash. The pig belongs to the village of Vaitahu and she has produced two litters, so she's quite a valuable commodity on the local scene. She's taken for a daily swim on a leash, which is how she happened to be walking on a leash right when us Aranui tourists were unleashed onto Vaitahu. I missed the pig swimming part and didn't hear about it until later—I was in the town's church, listening to Manarii of the Aranui staff singing hymns while I thought about bone carvings. 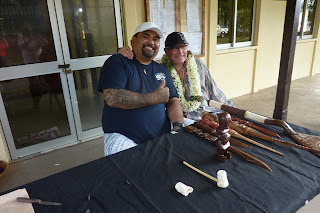 I'd never had much need for a bone carving before, but a carver named Teiki Barsinas had set up a table here and he was selling intricate and unique bone carvings for between $30 and $200. Vern had snapped up three items before I'd even seen the table. I'd fingered a piece and decided they were too expensive for me. I checked out Teiki's table again on the way back to the ship. He had only a few pieces left—one stunning $200 tiki, some shark-tooth earrings, one carving of a whale, and one ivory-colored tiki necklace that I'd been coveting earlier but at $80, I didn't think I could swing it. "Now you have to wait three weeks to sell these," I joked with the carver. 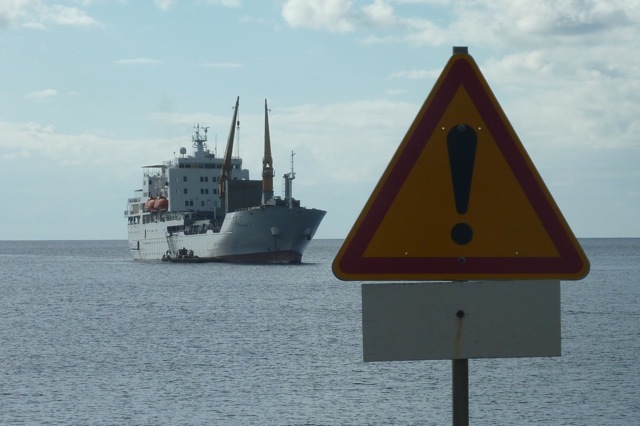 The Aranui comes by this town once every three weeks or so. "True, so these are now on sale," he said via an interpreter, who was also the guest lecturer on our ship. "Oh, really?" I tried not to appear too interested. "And how much might this be?" I pointed to the tiki necklace I'd been looking at earlier. "5,000," answered Teiki. About fifty bucks. "Sold," said Vern, picking up the necklace. "Hey, I want that," I said in faux-indignation. "Oh, sorry!" Vern didn't really need another tiki. He just couldn't walk away from such an exquisite piece at such a low price. 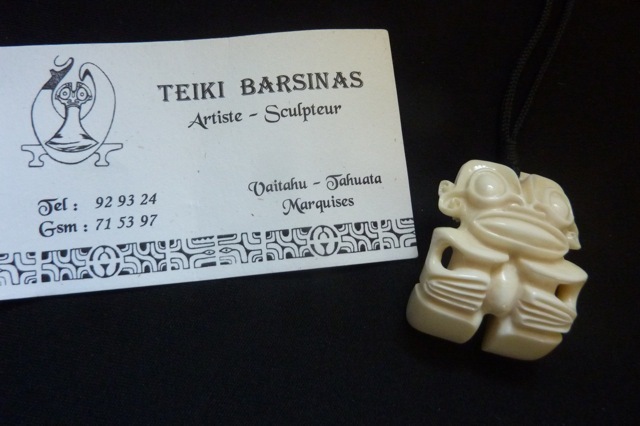 And that is how I ended up with a bone tiki from Tahuata. Now if only I had a power strip. Did you try and fix the power strip? It can't be that complicated. Probably just a fuse and the engineer may have one. The power strip never came back from the the office. 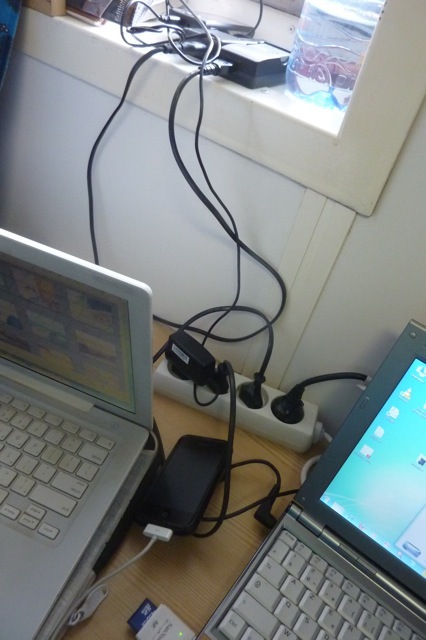 I'm sure they took one look at it and said "Hey, this is a fire hazard from the world's cheapest power strip factory."